In the histories of manuscript art, it is difficult to define, how the style of cave painting converted into flat type two dimensional art that specially composed for the ancient manuscripts. It is because of unavailability of the manuscript painting between of 7 to 10 century. The objective of the evolution of the conversion in manuscript art is still in the dark; however, we would define a reason behind it. But before explaining the reason, we have to specify the changes came in the manuscript painting. the traditional Indian craftsmanship that produces a prevenance. Most of the figures composed vertically, front faced bearing the entirety even in the group composition. It looks that all the figures are watching the audience instead of interacting with each other. Such a vision should be complete in any manner and that is why we could see in a few group compositions in Jain manuscripts where the figures although composed in profile angel, however, eyes always face up with the front view of the audience even in the matter of long distance from viewers. The reverberation of such factor we will see later in the Basohli kalam of Indian miniature painting. The objective of the artist behind such a style was to confer the absolute collectivity of the vision. The objective of the cave paintings was to grow the utter spiritual impact in the soul of common viewers and the devotees whereas the manuscripts painting composed for the new Irresolute learners to have a bit of entertainment besides reading the manuscript. Thus It helped readers to surmise the subject profoundly. It is hard to explain the correlation between the Buddhist paintings of Ajanta and the mural paintings of the medieval era especially, in Pala era because we have no demonstration of mural paintings in the said period even we have not found any written content of description of the chinese travelers. 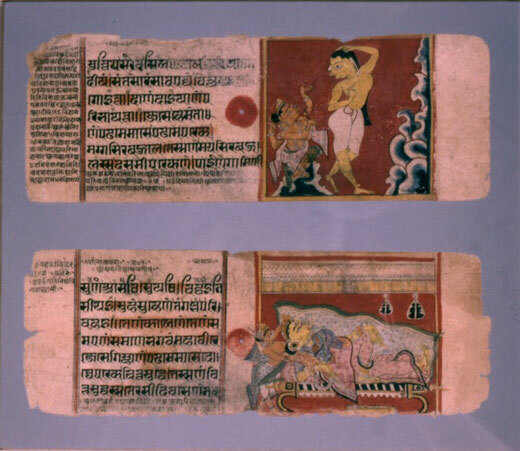 Based on the Samarangana Sutradhara there were eight aphorisms that have implemented in the Indian miniature painting. 1. Bartika. It’s not a method rather indicates a kind of pen used to make a drawing especially for mural painting. 2. Bhumi Bandhan. Referred to the drawing paper or the surface of the painting. 3. Lekkha. Indicates the painting. 4. Rekha. Meaning, the primary drawing of a painting. 5. Barnakarma. Suggest color preparation and color mixing. 6. Bartanakrama. Describe the plastic value and the modeling of a painting. 7. Lakhani. Final drawing based on the primary drawing suggested as Rekha. 8. Dwika Karma. Indicates the finishing touch of a painting. All the above-stated aphorisms successfully executed in the miniature form of manuscript art. At that time, the drawing composed just in the opposite color of the mass or object and finalized by using the same color of the object to create the plastic value. It’s indeed astonishing how they brought the modeling by just using the lines. Although, In the two-dimensional form, it is difficult to bring the modeling and plastic value, however, the said aphorisms they executed by the contrasting colors and later, in the miniature paintings of the Mughal era, we can experience the plastic value in a mass. In the manuscripts of the Pala era, we also undergo with a few values of modeling. 1. The Jātaka tales are a voluminous body of literature native to India concerning the previous births of Gautama Buddha in both human and animal form. The future Buddha may appear as a king, an outcast, a god, an elephant—but, in whatever form, he exhibits some virtue that the tale thereby inculcates. Often, Jātaka tales include an extensive cast of characters who interact and get into various kinds of trouble - whereupon the Buddha character intervenes to resolve all the problems and bring about a happy ending. 2. Basholi (Basoli) is a town in Kathua district in the state of Jammu and Kashmir, India. It is situated on the right bank of River Ravi at an altitude of 1876 ft. It was founded by Raja Bhupat Pal sometime in 1635. It was known for magnificent palaces which are now in ruins and miniatures paintings (Basohli Paintings). A famous Sikh-Mughal battle Battle of Basoli was fought at Basoli. 3. Samarangana Sutradhara is an encyclopedic work on classical Indian architecture (Vastu Shastra) written by Paramara King Bhoja of Dhar (1000–1055 AD).In 83 chapters, subjects treated are town planning, house architecture, temple architecture, and sculptural arts together with Mudras (the different hand poses and the poses of the body as well as the postures of legs), the canons of painting, and a chapter on the art of mechanical contrivances, the yantras (chapter 31).